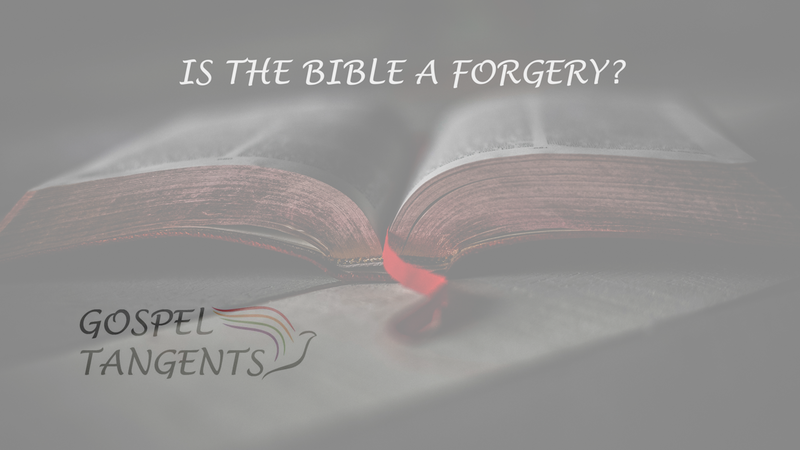 Home / Biblical Archaeology / What Does Sandra Tanner have to say about Biblical Forgeries? I’m going to add some comments from Facebook here so they don’t get lost. The context of Paul’s warning against people bringing preaching other Gospels (Galatians 1) had to do, as becomes clear as one reads on through Galatians, with forcing Gentiles who converted to Christianity to become Jews first, through circumcision and what not. I have never encountered a New Testament scholar who would make the case that Paul was referring to Gnostic Gospels. I can’t say for certain that there is no scholar who does not make that case, but it would certainly be an idiosyncratic one. When what might be called Proto-Gnostics make their appearance in the form, say, of the Docetists of the early second century. The argued not only that Jesus was not raised physically, but that he was not born physically either. The idea was that matter was evil, spirit was good, therefore Jesus would never have submitted himself to the indignity of actually being formed in the unclean womb of a woman, but that he only *seemed* to be (docetist comes from the Greek word which means “to seem” to be). There were of course Jews in the time of Jesus who denied the resurrection. They were called the Sadducees. Nevertheless, the Sadducees would have made common cause with the Pharisees against and the Christians against the Docetists and their successors the Gnostics because the latter viewed matter as evil and very often argued that the God of the Old Testament was either a stupid sub-deity of some sort or the devil himself. Of the three major sects of Judaism, Jesus was most affirming of the theology of the Pharisees. In the Gospels we find him opposing the views of the Sadducees and (without naming them), of the Essenes as well. It is important to note, as Rick points out, that pretty much all scholars view the Gospel of Judas to be a latter production with no connection to the historical Judas. The document is plausibly attributed to a sect called the Cainites, which Irenaeus does in his work Against Heresies 1.31 (c. 180). The Cainites were turn everything on its head kind of sect, which systematically made all the good guys in the Bible bad guys and all the bad guys the real good guys, along the lines of Philip Pullman in our own day. It should be said in terms of competing writing Gospels being referred to in the New Testament, in fact the great proliferation of alternative Gospels really only begins with a late second-century figure named Marcus. Prior to that the various Gnostic and similar groups tended to feature not alternatives to the four Gospels but rather one of the four. Although we do have Basilides the Gnostic being accused of writing a Gospel in the first third of the second century. So, for example, the Marcionites favored an edited version of Luke, the Ebionites, Matthew, the Carpocratians, Mark, and the Valentinians, John. The first Commentary on a New Testament book was by the Valentinian Commentator Heracleon in the later second century. I appreciate the info Ron Huggins. Surely you’ve studied this more than me. I believe in the PBS show “The First Christians”, they referred to the Gospel of John as a potentially Gnostic gospel. Have you heard that before? Hi Rick. Let me finish up and then I’ll come back and answer. Referring to what Rick says about our having no idea who wrote the Gospels. First a clarification. In introducing his discussion there he uses the terms forgery and pseudepigrapha. But in the case of the Gospels the most that scholars are claiming is that they were misattributed, after the fact. There is not attempt on the part of the authors of the Gospels to attach their works to any particular author. This is a distinction Bart Ehrman makes in his larger volume on Forgery. To say that the Gospels are anonymous in terms of the author not making mention of themselves within the text itself really emerged only after the Reformation as part of the Roman Catholic anti-Protestant apologetic: “You Protestants say that you don’t accept tradition, well if that is so you cannot have any idea who wrote the Gospels!” The argument itself was fallacious since the Protestants did not reject tradition as such, only tradition that was given the same authority as Scripture. The reality is that the Early Church was, so far as I have ever seen, unanimous as to the who wrote Matthew, Mark, Luke, and John. It was further universally understood that Matthew and John were members of the twelve Apostles and that Mark and Luke were not. Further there are no manuscripts of manuscript fragments of the four Gospels that include any other attribution than the traditional ones. The fact that the four Gospels did not attempt to establish their authorial bona fides by attributing themselves to prominent early figures in the Jesus movement certainly does nothing to undermine our confidence in the traditional attribution. One of the marks of pseudepigraphical compositions is the over eager attempt on the part of their authors to identify themselves with eye-witnesses. Books that begin with lines like “I, Matthew the Scribes, who sat at the Master’s feet many cool evenings taking down his divine utterances word for word as they fell from his divine lips,” hardly commend confidence. To insist that either the author names him/herself within the text of a work, or that we “know nothing about who wrote it,” really runs counter counter to common practice across the board. Philostratus, does not begin his Life of Apollonius of Tyana by saying “I, Philostratus, lover of wisdom, and friend of truth will not embark on a description of a most remarkable figure, bla, bla, bla.” And yet nobody says we “know nothing about who wrote” the work. The same is true in the case of the lives of St. Francis of Assisi. In neither of his lives does Thomas of Celano start by saying, I, Thomas, a monk and eye our beloved Francis.” Both statements would have been true but he doesn’t say either. Nor although Bonaventura provides details of how his biography of Francis came about, he does not name himself, and yet no one doubts that Thomas and Bonaventure were the authors. The reason is that in each case the identification of the authors was preserved in the tradition. The same is true of the Gospels. We could perhaps make arguments that the early Church were wrong about their attributions. Richard Baucham in his book Jesus and the Eyewitnesses, argues, for example, that the Gospel of John was written not by the Apostle but by another John. But we can’t say we have no idea. At the end of the day, the evidence for the traditional attribution of all four Gospels is actually quite impressive. “At the end of the day, the evidence for the traditional attribution of all four Gospels is actually quite impressive.” I would argue we don’t know if the early attributions were correct or not. It seems the attributions were consistent once they were made, but they weren’t included in the original text. From the scholars I’ve read like Ehrman, E.P. Sanders, Goodacre and Pagels, we don’t know who wrote them, only who they were attributed to. I have read those scholars and have interacted with all of them but one from time to time. In terms of my view of the Synoptic Gospels, Goodacre is like my polar opposite. Anyway, as I said earlier it is an opinion that has been parroted by many since the time of the Reformation. But it is not the impression one would get when focusing on the evidence of the early Church. It really gained currency among New Testament scholars as something you just unthinkingly repeated through the seventeenth and eighteenth century Roman Catholic Biblical scholar Richard Simon. Ron Huggins None of those authors I mentioned are the type who “unthinkingly” repeat anything, in my opinion. I read Sanders’ “Studying the Synoptic Gospels” a couple months ago, and if I remember correctly he went through the evidence for the authorship for the synoptic gospels. I would need to look at his arguments again, but it didn’t seem like he was just parroting something he had heard. That doesn’t mean they’re right, but I do think they have good reasoning for their position beyond just repeating what they’ve heard. Two major issues with thinking that the gospels were written by the people they were later attributed to are that the gospels were written at the earliest maybe 30-40 years after Jesus’ death (if you go with the earliest gospel, Mark, maybe written between 67-70 CE), and the people they were attributed to would have come from a part of Judean society where they spoke Aramaic and likely didn’t know how to read or write. If they did know how to read it’s another problem to assume that they knew how to write in Koine. While it is true that the earliest Christian tradition basically all agrees on identifying each of the gospels with the attributed names Christians now recognize as the authors, that does not mean that it then follows that those people actually wrote them. There were still several decades at least for the earliest commentators, and there is some confusion in some of the sources. In any case, besides all of that, those two main issues make it difficult for me to accept the idea that Matthew, Mark, Luke, or John wrote those books. I do think _a_ John wrote the gospel of John, and the same author who wrote Luke wrote Acts, but not that the people who knew Jesus wrote those gospels. Colby Townsend That’s how I see things as well. For the majority of New Testament scholars that I have read the last decade or so that is the case. Yes, but do you understand and embrace the reason why they embrace those dates? I was quoting those views concerning the claim that most scholars date the Gospels after the first century. Which, except for a very small number do not. Anyhow, Colby, in my asking, I do realize that both you and Steve Otterson are reflecting what many scholars argue. Definitely. But I’m also pointing out the two major reasons why scholars have that view: distance in time from the supposed authors and in education. Okay, could you give those two major reasons that establish the dates? Perhaps I missed it in your last post. The two arguments that seem to me to cast the most doubt that the supposed authors of the gospels could write the gospels is (1) the supposed authors didn’t have the training, couldn’t read or write, and if they could read it might have been Aramaic or Hebrew but they likely would not have known how to or would not have been capable of writing the Greek gospels, and (2) the separation of time would have required the supposed authors to be highly advanced in age, something unlikely coming from their place in society and life expectancy in the first century CE Palestine. Comments Installment III: All four Gospels written after 100 AD? Actually the towering majority of New Testament scholars no matter how liberal or conservative tend to see all four Gospels being written during the first century. Some earlier some later. In terms of earlier dates, we may think for example of John Shelby Spong’s mentor J. A. T. Robinson, who saw John being written before the other three. Let me offer a few quotes from the more liberal wing of Christian scholars. (1) Robert Funk: “Scholars…speculate that Mark was composed in the decade of the 70s; Matthew and Luke were probably written a decade or two later The Fourth Gospel probably appeared at the end of the first century.” Funk was the founder of the Jesus Seminar. (3) James M. Robinson: “They were composed in the last thirty years of the first century…but all four Gospels are of course cited here by their traditional names, Matthew, Mark, Luke, and John.” Robinson was the editor of the Nag Hammadi Library. F. F. Bruce wasn’t Bart Erhman’s teacher, Bruce M. Metzger was. Perhaps Sandra misspoke. Bruce’s student Ward Gasque was one of my readers on my Masters Thesis, and I certainly do recommend the book by Bruce that Sandra Recommended. Yes, Sandra sent me a message saying she misspoke, and meant Bruce Metzger. It is odd how often it is assumed that Jerald and Sandra never examined the claims of critics of the Bible. She notes in the interview that she never learned Greek or Hebrew not pursued an education which would give her particular expertise in those areas. Neither did Jerald. But in fact Jerald did address many of those issues in various books. These would include the early works Archeology and the Mormon Bible (1969) and Mormon Scripture and the Bible (1970). And most particularly Jerald’s A Look at Christianity (1971), in the last mentioned Jerald takes on such questions as whether Jesus every really existed. Very likely he wrote this book as an answer to his atheist father George, as was the case as well with his 332, 81/2 x 11 page Views on Creation, Evolution and Fossil Man (1975). The weakness of both works was the extent to which he had to rely on quoting experts due to his own lack of expertise in those subjects. This was a feature of his earliest works on Mormonism too, but with time, he gained real expertise of his own. Rick , On your question whether the Gospel of John a potentially Gnostic gospel. There’s a long and rather complicated interpretive history on that, but I won’t go into it here. Short answer. No. A key, but admittedly not a universal feature of Gnosticism was denying the essential goodness of the material world, which included the human body. That’s why they denied the incarnation of Jesus and his physical resurrection. But these were precisely what John defended both in his Gospels and his epistles. Thus as John 1:14 stresses how in Jesus “the Word (Logos) became flesh and dwelt among us.” In the first chapter of his Gospel, John’s use of the term “Word” (logos) resonates on the one hand with Genesis 1, where God creates everything by his Word, and secondarily with the Stoic idea of the spermatic logos, in its function of “enlightening every person.” It does, I think echo some extra Jewish ideas but not the goodness of the flesh the goodness of creation. John”’s posture on this comes through even more strongly in his Epistles, where he says things like: “Every spirit that acknowledges that Jesus Christ has come in the flesh is from God, but every spirit that does not acknowledge Jesus is not from God. This is the spirit of the antichrist (1 John 4:2-3). In a docetic work like, say, the Gospel of Peter, Jesus is presented as not suffering on the Cross at all The Jesus of John’s Gospel, get tired (John 4:6), thirsts (John 19:28), and can be overcome with grief (John 11:35). Thus even though the Gospel was particularly cherished by the Valentinian Gnostics in the second century, the early Orthodox believed it had actually written against them. Finally there is the colorful story told by John’s disciple Polycarp on how John was once bathing in a bath house in Ephesus, but that when the Gnostic teacher Cerinthus came in, he said basically, ” Ah, look here come the heretic, let’s get out of here lest God strike the place and its collapses (the story is related by Irenaeus, who had seen Polycarp as a youth in his Against Heresies 3.3.4). Colby Townsend Those are all good questions. But they presuppose that the Gospel of Mark was written as late as 67-70. This is still within living memory, parallel for example, to the someone writing their recollections of Joseph Smith in 1877-80. But why do you believe that Mark was writing at that date? I’m really enjoying the conversation, even if I can’t contribute much. Keep the comments coming!!! I love these comments. One of the things about Facebook is that conversations like this get lost. Would anyone object to me copying and pasting these comments on my blog? I certainly wouldn’t. Thanks Rick for your FB hospitality! While even some liberal scholars such as Funk, Borg, Robinson, Ehrman, Spong, etc., lean towards the view that the original Gospels were written during the first century, it might be emphasized that they are referring to just that, the originals. As Ehrman has said, what we now have are copies of copies of copies, etc. In addition, those scholars, and even some on the more conservative side, detect evidence that during the decades following the ministry of Jesus–yet before the writing of the original Gospels in question–inventions, elaborations and exaggerations were being integrated into the Christian story which do not represent history as it actually happened. They point to a number of textual problems and seeming contradictions within the Gospels themselves to suggest these stories were passing through an evolution which tended to make the Christian tale more grandiose as it went. They claim that after those Gospels were written in the first century, further redactions and additions were made within subsequent copies of the texts, most minor, some significant. So they conclude the texts we now have, while they may be similar to the originals in most or many aspects, are not exact representations of those first century Gospels, nor are the first century Gospels historically accurate representations of the life and deeds of Jesus. It seems to me that if there is any validity to such a view, then a better parallel to be made with Joseph Smith would be if several people who may or may not have been very close to him during his sojourn on earth–but who were fanatically faithful–wrote exaggerated reminiscences of their experiences and his teachings 40 to 90 years later, which were then copied numerous times, with evidence of some tinkering during the process, and not always agreeing in detail with one another. It would leave us studying the life and teachings of Joseph Smith from later copies of those histories which date to approximately 2144 AD. Ron, I appreciate the writeup. One question I had was this. Sandra mentioned the Tanners were professors at BYU, so stating Jerald’s father was an atheist surprised me a bit. Do you have further background on this? Jerald and Sandra Tanner weren’t professors nor was his dad. George Tanner was a meteorologist. The Tanner educators went further back. Two sons of Myron Tanner from two different wives went to Harvard, Jerald’s grandfather Caleb Tanner, and his half brother (by a sister wife) Joseph Marion Tanner. Joseph Marion was the father of O. C. Tanner. Vasco’s brother Wilmer W. Tanner, was also a professor at BYU and may have been at the funeral. I can’t remember the names of all the Tanners I met at that time. Anyway, Jerald’s mother made quite a point of the fact that so many prominent Tanners came to the funeral.